Make sure to stop by the Save the Salt booth if you are attending the 2017 SEMA Show and see Team Vesco's Turbinator II streamliner on display in Hot Rod Alley. With its current FIA certified World Record of 458MPH, this is the World's Fastest Wheel-Driven Car on the planet. The car was driven to glory by the late, but oh, so great, Don Vesco.Just prior to the big Vegas show, the team will be featured on History's very popular program "Counting Cars" on Tuesday, October 24th. The Turbinator II body was badly damaged in a mishap at 400 MPH during the Utah Salt Flat Racing Association September 2016 Wold of Speed event. Danny "The Count" Koker and airbrush artist Ryan Evans applied one of their legendary paint jobs to the new Turbinator body and he, together with builder Rick Vesco, be on-hand at the booth signing posters for fans. The Bonneville Salt Flats International Raceway (BSF) is the densely packed salt remnant of an ancient lake bed formed over thousands of years. Beyond its irreplaceable beauty, the flats possess rare physical qualities which make it a destination for land speed racing, filmmaking, rocketeers and tourists from all over the world. Bonneville has been called the birthplace of “hot rodding” and has been used for racing events since 1914. The 300, 400, 500 and 600 mph land speed record barriers were broken on its natural straightaway. Since the 1920s, automakers, speed equipment manufactures and tire companies have used Bonneville as a testing laboratory for products we all rely on today. All this adds up to a rich land speed racing legacy including the world-famous annual Speed Week event. 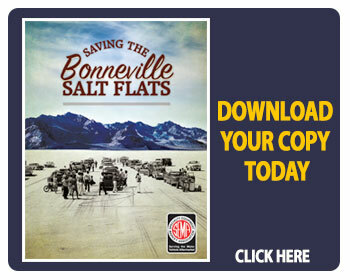 Bonneville has earned protected status that recognizes the importance of land speed racing as a compatible use. This unique, geologic phenomenon in northwestern Utah, was originally 96,000 acres in size but has been reduced to less than 30,000. Despite being listed on the National Register of Historic Places, and federally designated an Area of Critical Environmental Concern (ACEC), millions of tons of salt have been transferred away over five decades due to potash mining. The leftover salt material is a waste product, abandoned in the evaporation ponds located on public and private lands nearby. One pond alone contains enough material to resurface the entire historic 13-mile raceway to a depth of nearly 7-inches through a reintroduction process. If corrective actions are not implemented soon our national treasure will disappear altogether and become another dry lake mud flat. 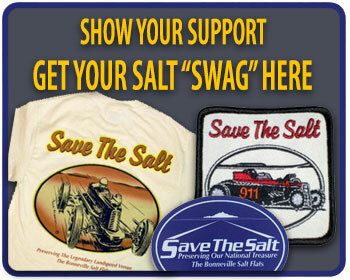 Since 1997, the motorsport racing community has worked to return salt each year to the flats, but it is a long-term project and in need of partners.